We discover the best, the most serene and beautiful things when traveling around the world. In addition, later on, viewing photos and videos, we reminisce sweet moments, great and little discoveries and experience once again magic minutes of the traveling, dream turned into reality. 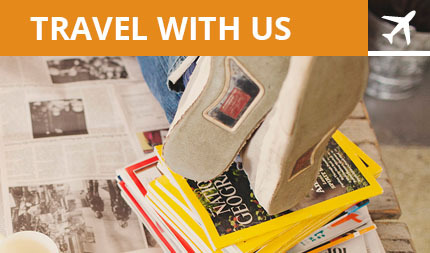 Make your dreams come true: travel with Intertour! All you need is to tell us about your desires and to receive the ideal offer for your leisure. We are always reliable and can do your leisure interesting and unforgettable. It is confidence that the visit to the travel agency, once selected, begins and ends with. I consider myself a rather uneasy and choosy customer, and not without reason. I have two children aged 6 and 14 years, and we got used to travel more than once a year. Several years ago, advised by my friends, I came to InterTour Astana and realized that was just my company. I always feel that Damira and her girls are near and ready to help, foresee, and settle any situation. No wonder that I started recommending this agency to all my friends, and they became clients. We appreciate the «INTERTOUR Astana” for the care, safety and exclusive approach to each client! Guided by our Director, we have “matured” and occupied a deserved place in this business. We can speak a lot about our job and for a long time, as it is our favorite topic. It gives us an opportunity to communicate with people, allows us to broaden horizons and to visit other countries! Our tourists pose the main object in our job. One always wants to do even more that one can, to make them happy because of each small thing, add zest to their leisure for each travel to be unforgettable! We have a lot of plans and ideas; join us! Do you love your job the way we love ours? We have some heavy reasons for it! Firstly, they are our customers who come to us, first of all, looking for professionalism, skills, and knowledge, and they count on us. And we believe we live up to our expectations fully! Secondly, that is our customers’ gratitude and appreciation that bring us a great satisfaction and joy. The third reason we consider a decent evaluation of our activities, which gives us the sense of stability and confidence in the future. And one more reason why we hurry to our job every morning joyfully is our strong and inexhaustible team of professionals, in love with their business.